Two government websites in Hawaii received national recognition this week, and one of them is in the running for even more acclaim. Harvard University’s John F. Kennedy School of Government recognized the City & County of Honolulu for its all-online neighborhood board elections. It was one of the 2015 Bright Ideas included in this year’s Innovations in American Government Awards. Also recognized was the state’s my.hawaii.gov portal. The portal integrates seven departments and has continued to evolve as a hub of business that is connected with the state. It’s very pretty, it says it loves you, but with the resources of HIC behind it, excellence is a frequent outcome. The Neighborhood Commission Office has a more interesting story. The NCO has been innovating online for some time, sometimes because of neccessity. The office experimented with the option for online voting in 2007, after the mail-in ballot system saw a quarter of envelopes returned. Budget cuts also played a part. The 2009 neighborhood board election was the first to be conducted entirely online, and it was touted as the first all-online election in the country. But turnout was low (6.5 percent) and many blamed the shift to online voting. Fortunately, the office stuck with it. Participation edged upward to 13,264 voters (8.5 percent) in 2011, one subdistrict seeing 22.7 percent turnout. In 2013, things grew a bit more to 15,318 voters (8.61 percent). It’s the 2013 neighborhood board election that is being recognized by Harvard’s Kennedy School awards. But two of the main challenges of Honolulu’s neighborhood board system is low awareness, and thus low participation on the boards themselves. Only 379 of 439 available seats were filled in 2011, leaving 60 empty. In 2009, the election filled 388 of 439 elective seats, with 51 lacking candidates. Since then, the NCO has broadened its outreach beyond the election process, and focused on strengthening the neighborhood boards themselves. 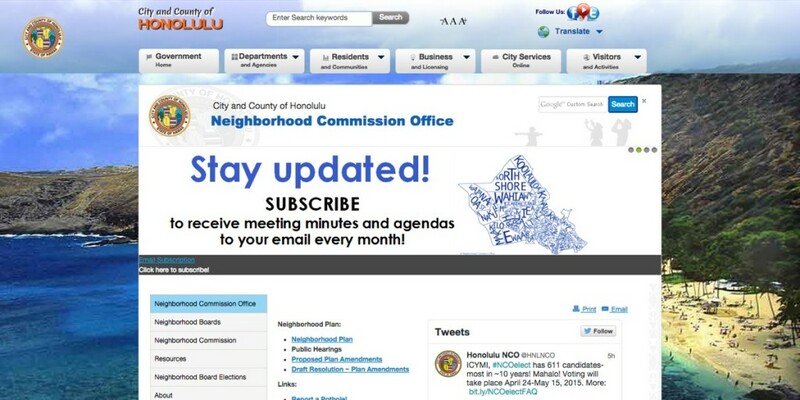 Under the leadership of NCO executive secretary Nicole Velasco, who was appointed in 2013, the office invested heavily in social media as a platform to reach and engage Honolulu residents. Passionate about politics (she tells her story of running for office in this TEDx Talk in 2013), Velasco was lauded as one of “20 for the Next 20” people to watch just last year. She is focused on increasing participation in the neighborhood board system. Only 18 percent of board members were under the age of 45, and 38 percent of members served for more than 10 years, according to a 2014 survey. Worse, 35 percent of people had never heard about the neighborhood board system at all. “The NCO identified a need to increase citizen engagement to reflect the true demographic make-up of the island and to bring more people into the system,” the awards entry reads. One way to do this? Social media. The NCO is now very active on Facebook and Twitter, as well as on Instagram, Tumblr, YouTube and even Google+. Perhaps most interestingly, the office hosted a #NCOTweetup. It is this tech-savvy community outreach event that is being recognized in the “Social Media for Citizen Engagement” category of the first Government Social Media conference awards. Further evidence of success? The office announced on Monday that for the 2015 elections, it ended candidate filing period with over 600 candidates… the most in at least ten years. This year’s neighborhood commission voting period will run from April 24 through May 15. But the more immediate voter turnout opportunity is happening now. The Government Social Media conference’s “Golden Post Awards” are decided by public vote. And while the Honolulu Neighborhood Commission Office is in the top 10 as of this writing (with 37 votes), it’s well behind frontrunners with over 40, 50, even 90 votes. 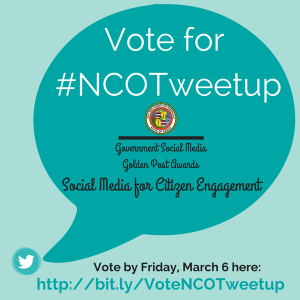 So if you are impressed with the NCO’s efforts online, from all-online voting to harnessing social media to increase participation, you should vote for the program now. Voting is handled via List.ly and Twitter or Facebook logins.